Racism is a major problem in Italian football – just ask Mario Balotelli, who fled Italy the first chance he got, only to return three years later to escape the not-racist-but-still-pretty-awful English press. 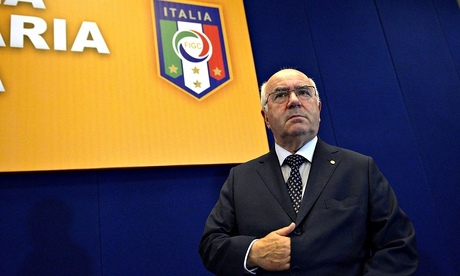 That problem just got a whole lot worse: Earlier today, Carlo Tavecchio, a bona fide racist, was appointed president of the Italian Football Federation. In July, Tavecchio said he hopes to strengthen the rules governing non-EU players, so that Africans “who previously ate bananas” can’t insinuate themselves into Serie A.
Tavecchio won 63 percent of the vote. I think it’s time for Balotelli to move back to England. 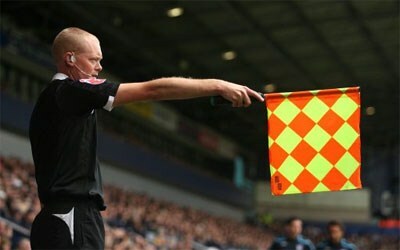 If you’re new to soccer and confused about the offside rule, don’t go to Slate.com for help. I’ve enjoyed Slate’s coverage of the 2014 World Cup – a new podcast, a regularly updated blog, etc. – but this video, which promises to “clear up your offsides confusion for good,” is pretty awful. It assures viewers that, without the rule, soccer would be “mayhem, chaos, a catastrophe” but never explains why. (For one thing, strikers would crowd the opponent’s goal, waiting for long balls to be hoofed into the penalty box.) And it repeatedly uses the word “offsides” instead of “offside” — a common mistake, but still. By the way, if you want to see the offside rule in action, watch a rerun of Italy’s 1-0 loss to Costa Rica. The toothless Italian offense seemed as confused about the rule as the legions of soccer newbies Slate is failing to educate. 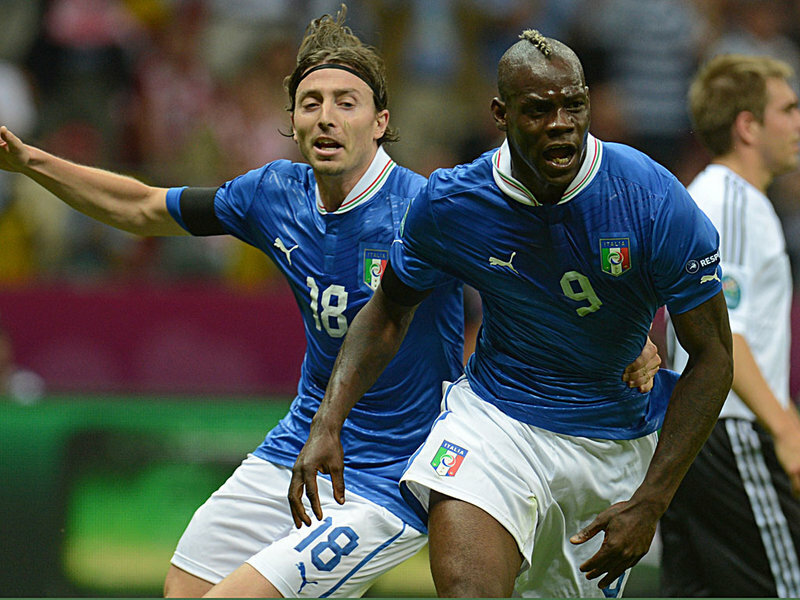 Mario Balotelli stood shirtless, his intimidating muscles flexed, staring straight ahead. He refused to betray any emotion. Indeed, he refused to do anything other than stand and stare. But then his teammates engulfed him, and, through a crowd of sweating bodies, his face slowly softened into the faintest trace of a smile. On Thursday night, Loew’s German players stopped being world beaters and instead became nearly-men. Italy progressed to the final, where they will serve as the last obstacle in Spain’s pursuit of a historic third consecutive tournament victory. Antonio Cassano, who suffered a stroke in October, elevated himself from endearing bad boy to national hero. Andrea Pirlo commanded midfield with his customary elegance and poise, but the contributions of others overshadowed him. Italy’s was the ultimate team performance. The one thing missing from Cesc Fabregas’ catalogue of honors is a victory at a major club tournament. Fabregas has never won a league title or a Champions League. In terms of trophies – and, in the modern game, football success is almost always measured in trophies – Fabregas still lags behind his international colleagues. His move to Barcelona was supposed to change all that, and, eventually, it may. Last season, however, Fabregas failed to justify the years of wrangling that preceded his transfer. Although he impressed for the first few months, injury halted his progress, and he never regained that early momentum. In the months between Barcelona’s trip to Espanyol in January and Spain’s opening game two weeks ago, he didn’t score a single goal. Fabregas’ barren run seems even worse compared with the recent successes of his Spain teammates. 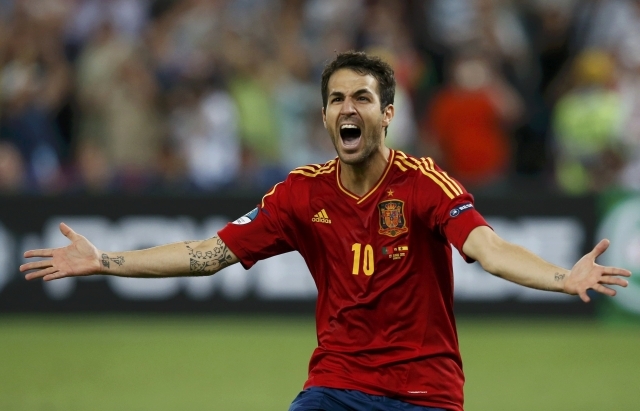 Fabregas is part of a generation of Spanish footballers that will probably never be bettered. The Xavi-Iniesta-Busquets-Alonso midfield is peerless. The presence of those four footballers, as well as striker David Villa and defenders Gerard Pique and Carlos Puyol, in the same country at roughly the same time is a never-to-be-repeated phenomenon. 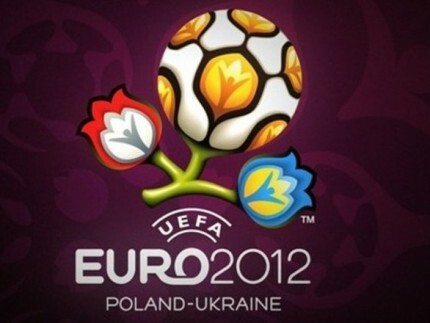 And thus begins another two years of hurt for England. The only difference this time is that the inevitable penalty- shootout defeat was a deserved punishment, rather than a cruel trick of fate. England’s tournament destiny was sealed the moment that injury ruled out Jack Wilshere. Wilshere isn’t the first, and certainly won’t be the last, player to be touted as the “future of English football,” but he would have added cohesiveness to an England midfield that was outnumbered and overrun in all four matches. With Wilshere unavailable, Hodgson should have worked harder to recruit a player capable of dictating the tempo of a game. Gareth Barry was never going to be the answer. Michael Carrick and Paul Scholes are the only fully fit English players at all comparable to Italy’s Andrea Pirlo. But Carrick turned down a place in the squad when Hodgson refused to guarantee him a starting spot. And Scholes, frustrated by coaches who constantly played him out of position, had retired from internationals in the mid-2000s. He showed no interest in a return. 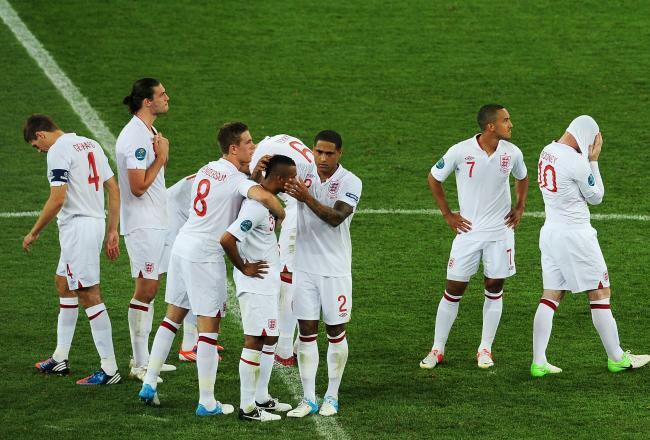 Without a passer in midfield, England never had a prayer. Possession is the crux of international football, and it was England’s inability to maintain possession that ultimately cost them a place in the semifinals. Look under the letter “G” in football’s coffee-stained, dog eared lexicon. Run your finger down the page, past “Garrincha,” past “Gascoigne.” Stop. Squint closely. Absorb the clichés, the fallacies, the half-truths, the stereotypes, and the crass World War II references. Shut the book. Burn it. The Germany of the lexicon are efficient and pragmatic, the big bullies who nicked Johan Cruyff’s lunch money. For fans and the media this traditional picture of a German footballer – quiet, serious, stolid, ice-cold – is a comfortable, self-perpetuating myth. The more the public believes that all German footballers are cold-hearted killers, the more reality seems to conform to that belief, even if the belief is blatantly erroneous. Terms like “German efficiency” are standard football vernacular. But anyone with a background in German football history knows that the truth is more complicated. 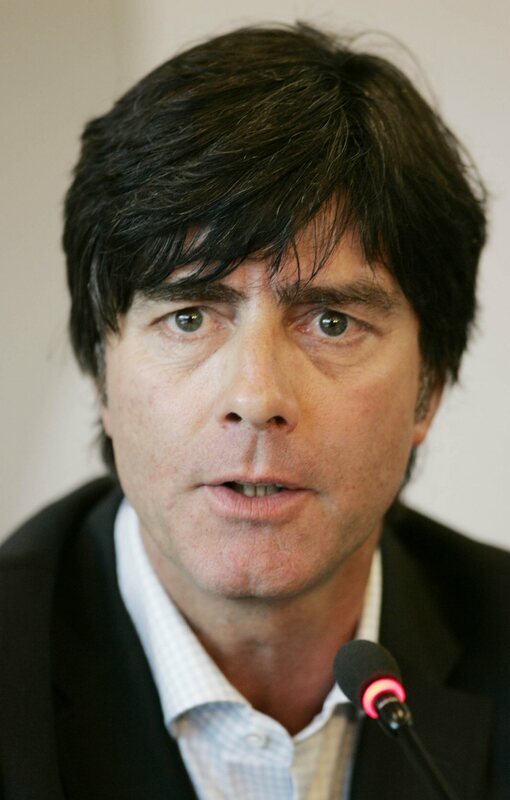 And anyone with eyes can see that Joachim Loew’s Germany are hardly an emotionless winning machine. Ten months have passed since Wayne Rooney aimed a kick at Miodrag Dzudovic’s leg. That moment of madness spawned a brief public hate campaign against Rooney, a frustratingly familiar routine that lost all momentum when England fans realized that the Manchester United striker represented their last, tenuous hope of tournament success. 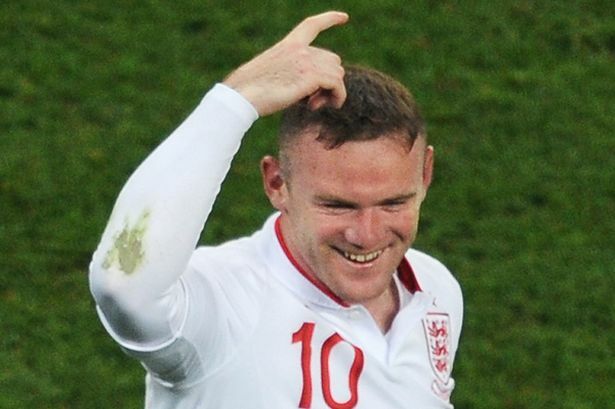 Rooney, who has polarized opinion since his emergence on the international stage in 2004, is one of only two players to have been sent off more than once while playing for England. The other is David Beckham. You could hardly find a starker contrast. Beckham is suave, handsome and married to a pop star; rumor has it that his match-worn jerseys smell of something suspiciously like perfume. Rooney is rough, ugly and married to his childhood sweetheart; in 2011, he swore loudly at a camera during an overly boisterous goal celebration. What Beckham and Rooney have in common is an uncanny ability to frustrate and inspire in equal measure; especially when playing internationally.